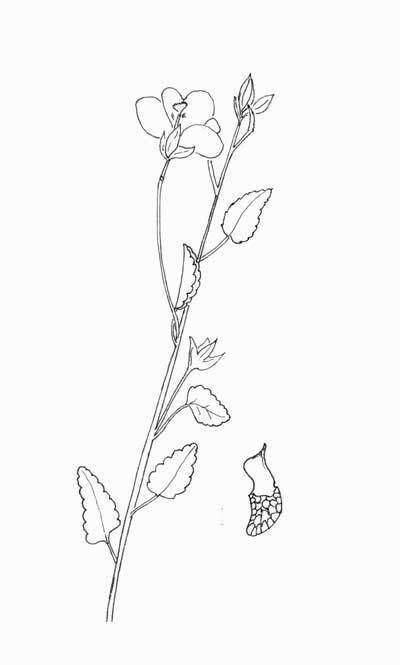 Drawn from a specimen found at Catalina State Park, Sta. Catalina Mts., AZ. 19 Sept. 1994. Enlarged view of a single-seeded dry fruit segment (shizocarp) at lower right. RANGE: Upland Sonoran Desert in the foothills around Tucson, Arizona ranging hence south and east. FRUIT: Breaks apart into separate carpels (shizocarp) each of which has a smooth top and a reticulated base. PERENNIAL HERB / LOW SHRUB: Slightly woody above crown reaching a meter-and-a-half or so in height. Possesses a long woody taproot. FLOWERS: smallish, solitary orange-yellow flowers with five wide-spread petals. Numerous stamens typical of Malvaceae united into a stamen tube. LEAVES: Usually triangulate with distinctly crenate (rounded) teeth.